LogCleaner is created exclusively when LogManager is created (with enableCleaner enabled which is the default). When created, LogCleaner is given a CleanerConfig that LogManager builds when created (when KafkaServer is requested to start up). LogCleaner is a KafkaMetricsGroup and registers performance metrics. 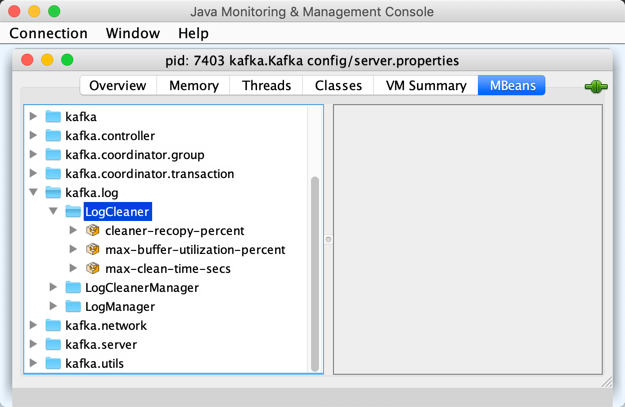 The performance metrics are registered in kafka.log:type=LogCleaner group. Enable WARN or INFO logging levels for kafka.log.LogCleaner logger to see what happens inside. That means that the logs of LogCleaner go to logs/log-cleaner.log file at INFO logging level and are not added to the main logs (per log4j.additivity being off). LogCleaner initializes the internal registries and counters. startup creates new CleanerThreads and starts them all immediately. startup adds the cleaner threads in cleaners internal registry. The number of CleanerThreads is controlled by log.cleaner.threads dynamic configuration (default: 1). cleanerConfig simply creates a CleanerConfig from the given KafkaConfig. CleanerConfig is created exclusively when LogCleaner is requested to build a CleanerConfig from a KafkaConfig. awaitCleaned seems to be used exclusively in tests. alterCheckpointDir is used exclusively when LogManager is requested to replaceCurrentWithFutureLog. handleLogDirFailure is used exclusively when LogManager is requested to handleLogDirFailure. updateCheckpoints is used exclusively when LogManager is requested to asyncDelete. maybeTruncateCheckpoint is used when LogManager is requested to truncateTo and truncateFullyAndStartAt.